JEDEC this week published their UFS 3.0 specification, which is intended to bring numerous performance, power and feature set-related improvements to the standard. The version 3.0 of the spec doubles the per-lane performance of an eUFS device to 11.6 Gbps, which increases the peak data transfer rate of a storage device to 23.2 Gbps. At the same time, the new standard introduces a 2.5 V VCC power supply mode that enables lower power consumption and support for the latest types of NAND. Finally, the UFS 3.0 spec contains features designed specifically for automotive applications that enable standard support for extended temperature ranges as well as “refresh” operation to boost reliability. One of the key improvements of the UFS 3.0 (JESD220D) specification is the usage of MIPI's M-PHY 4.1 physical layer as well as the recently released MIPI UniPro 1.8 protocol to form the interconnect layer (IL). The new IL supports data rates of up to 11.6 Gbps (HS-Gear4) per lane as well as QoS features to enable a more reliable link through monitoring and training of the communication channel. All UFS 3.0-compatible devices are required to support HS-G4 (11.6 Gbps) and HS-G3 (5.8 Gbps), which means that they all will be faster than UFS 2.0/2.1-compliant devices that do not necessarily support HS-G3. 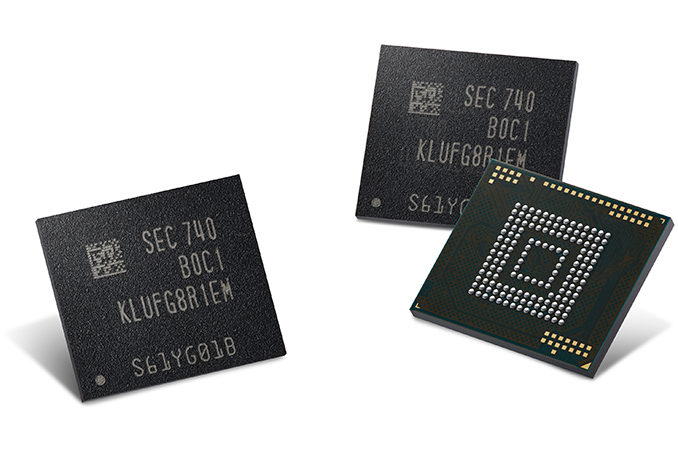 UFS 3.0 storage devices will continue to feature up to two full-duplex lanes, which means a theoretical maximum bandwidth of up to 23.2 Gbps (2.9 GB/s) when HS-G4 is used. The MIPI M-PHY 4.1 standard continues to use 8b10b line encoding, so accounting for the encoding overhead, the actual achievable bandwidth by an embedded UFS device will be considerably lower than the theoretical one — 15 Gbps (1.875 GB/s) is something that is reasonable to expect. The upcoming eUFS 3.0 storage devices will require three different power rails: 1.2 V for VCCQ, 1.8 V for VCCQ2, as well as 2.5 V/3.3 V for VCC. The addition of 2.5 V for VCC is to enable support for the latest and upcoming generations of NAND flash with higher bit densities (including 3D NAND with higher amounts of layers as well as 3D TLC NAND). The UFS 3.0 standard also supports a number of features particularly suitable for the automotive industry. UFS 3.0 devices may support a native predefined low/high temperature event notification which will simplify development of UFS-based automotive applications. Extended temperature ranges (-40°C, 105°C) will be optionally supported by host controllers. Furthermore, the latter might also adopt a standard “refresh” function to extend data retention by moving data from cell to cell to keep charges at sufficient levels. Another important innovation of the UFS 3.0 spec is enhanced support for RPMBs (replay protected memory block). The new standard supports multiple RPMBs with multiple RPMB keys. Furthermore, RPMB regions can now be configured at manufacturing, simplifying their usage for device makers. To simplify development of UFS-based applications going forward, JEDEC also released JESD223D — a functional specification of a UFS host controller interface (UFSHCI). This spec defines features and registers that have to be supported by UFS 3.0 host controllers and enable usage of a standard driver for all applications featuring UFS 3.0-compatible storage devices. The UFS 3.0 standard greatly speeds up performance and capacity of storage subsystems inside smartphones, tablets, media players, VR headsets, automotive and other applications that are going to use it. Meanwhile, it is not clear when this might happen. There is at least one company who has been offering UFS 3.0 controllers since Q2 2017, but it looks like the latest mobile SoCs from Qualcomm, HiSilicon, MediaTek and Samsung do not support the new spec. That said, expect applications based on the new standard to be released in the coming years, just not in 2018. "All UFS 3.0-compatible devices are required to support HS-G4 (11.6 Gbps) and HS-G4 (5.8 Gbps)..."